The city (and particularly, Toronto’s lakefront) offers lots of opportunities for end-of-summer fun! 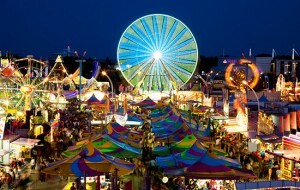 The most fitting description of the Canadian National Exhibition might be that it has “everything but the kitchen sink.” The Ex, as it’s affectionately known, is a carnival, agricultural fair, culinary smorgasboard and outdoor performance event rolled into one and then spread over 18 end-of-summer days (it starts on August 15). More than one million attendees make their way to Exhibition Place each year for the fun (rides, midway games, live shows), the thrilling (a zip line, daredevil stunt demos and the Canadian International Air Show), and even the unusual (butter sculptures, deep-fried beer, a cat show). Though the Toronto Islands are accessible year-round, summer is a quintessential time for a visit. Ferries shuttle visitors from the mainland to docks at Centre and Ward’s islands and Hanlan’s Point. From there you can head to the beach (modest folks should note that Hanlan’s Point Beach is clothing-optional) or family-friendly attractions including Centreville Amusement Park—complete with a log flume ride and a carousel that dates back to 1907—Far Enough Farm and the Franklin Children’s Garden, and landmarks like the Gibraltar Point Lighthouse, the oldest surviving lighthouse on the Great Lakes. Officially it’s recognized as The Beach, but depending on whom you ask it’s also called The Beaches. No matter how you refer to it, this east-end neighbourhood is a hub of warm-weather activity with sun worshippers, families and active-minded folks jogging or rollerblading down the boardwalk or playing beach volleyball along the sandy shore. Soak up some rays or cool off in the lake at Woodbine and Kew-Balmy beaches. The lengthy Martin Goodman Trail also passes through the area, and is ideal for a scenic bike ride.